Cohen Carnaggio Reynolds Architects in Birmingham, Alabama believes in a work/life balance for their employees. This lifestyle requires a work environment conducive to entertaining and relaxing. 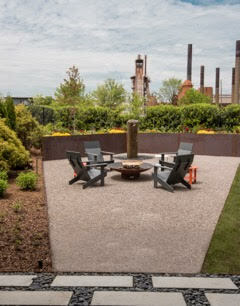 Our design team provided the office with a bocce court and outdoor fire pit ideal for hosting office gatherings. 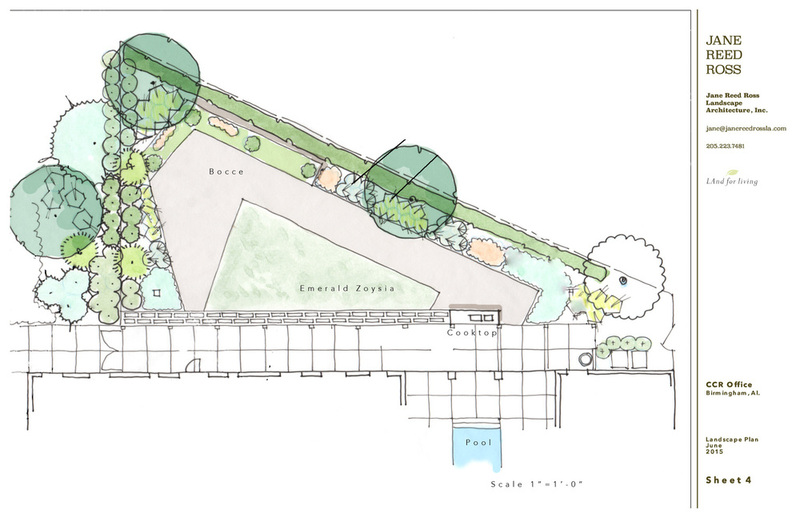 Each end of the bocce court has a sculptural focal point. The west focal point is a black basalt column fountain, that echoes the towers of Historic Sloss Furnace in the background. The rustic red of Corten steel edging and planters reflects the metal elements of Sloss. The steel edging outlines the court and sod lawn on the interior. The area was plagued with drainage issues and standing water after storms. A french drain was installed and dressed with black river stone between concrete plank pavers made locally. The garden was presented with a 2017 ASLA Merit Award.